View More In Coffee Machines - Page 8. 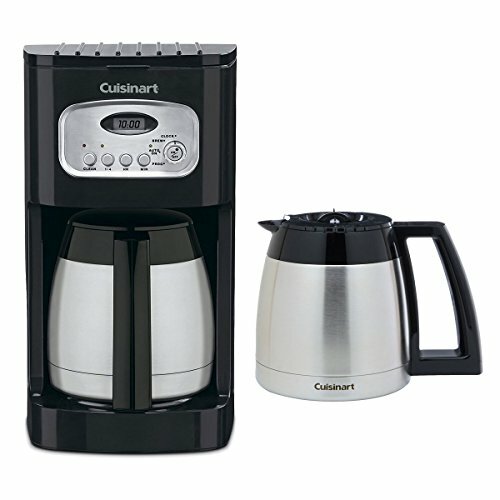 A nice addition to any modern kitchen, this fully automatic 10-cup coffeemaker features 24-hour programmability--great for waking up to the aroma of freshly brewed coffee. The unit offers a 1- to 4-cup setting for brewing a smaller amount without compromising flavor, and its brew-pause function allows for pouring a cup before the brew cycle has completed. The included 10-cup double-wall insulated thermal carafe comes with a generous stay-cool handle and a dripless pour spout for comfortable, drip-free serving. Providing added convenience, the coffeemaker automatically shuts off at the end of the brewing cycle, and its 60-second reset "remembers" where it was in the brewing process and settings. Accessories include a charcoal water filter, a gold-tone filter, and a user manual. If you have any questions about this product by WhoIsCamera, contact us by completing and submitting the form below. If you are looking for a specif part number, please include it with your message.